Kai Matsumiya announces “JaJaJaJaJaNeinNeinNeinNeinNein” by Jan Kiefer. The solo exhibition opens Sunday, May 7th (7–9pm) and marks Kiefer’s debut in the United States, and follows his solo show “honeybaked” at Kunstverein Salts, Basel (Switzerland). The title “JaJaJaJaJaNeinNeinNeinNeinNein”, translated as “YesYesYesYesYesNoNoNoNoNo” in German, refers to Joseph Beuys' landmark audio work “JaJaJaJaJaJaNeNeNeNeNe” (1967), in which he repeated the phrase like a mantra in monotonous, compulsive fashion. The two-hour audio performance means everything and nothing, while perhaps expressing the assertive ambivalences of everyday life. Jan Kiefer, in turn, lengthens the word “ne” to the longer “nein”, much like “yeah” is to “yes”, and explores the two familiar symbols of ordinariness pertaining to the yes/no condition: the staircase and the piggy bank, which simultaneously exalts and saddens the mundane. 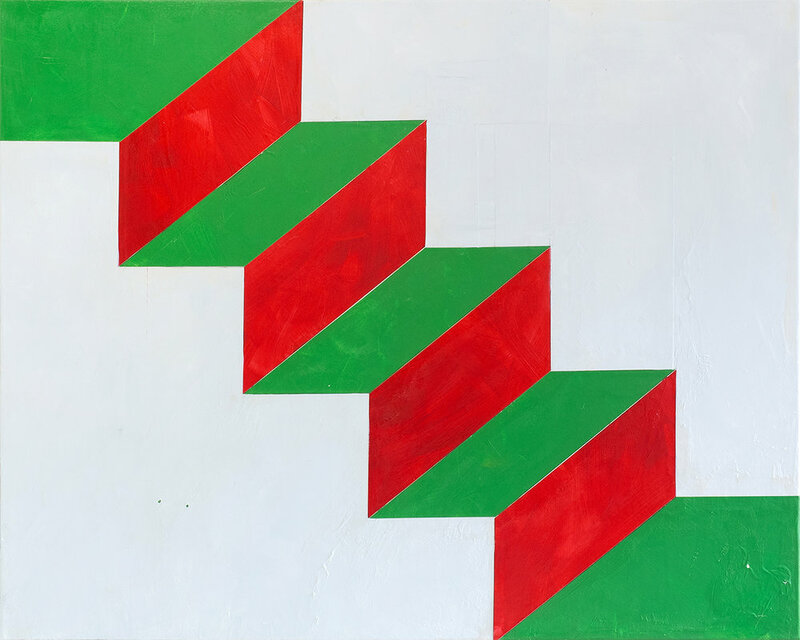 Upon entering the gallery, visitors encounter dozens of same-sized paintings depicting colored staircases in their most fundamental bare-bone shapes and forms, all of which signify, depending on the viewer, a yes or a no. The staircases—divided into segmented grids forming a constellation, or a large tableau—move across all possible directions in space. Staircases hardly contain many rules, and such rules are universally absolute. They go up or down, left or right, and in varying angular directions in order to facilitate movement from a higher or lower location to another with less effort. They represent the most ancient of technologies, a principal ever-present architectural element. Such representations of the staircases are collaged with hand-painted pieces of paper which appear as if a sincere hard-fought attempt failed to execute clean, sharp edged, and shiny contemporary designs with its rough, wrinkled, and speckled damages. The piggy banks, hand-lacquered in colored stripes resembling national flag designs, situate themselves amidst the staircases. Kiefer employs the most traditional form of the piggy bank in which smashing the object is required for coin access, rather than the type in which a plug is opened at the underbelly. Taken together, the staircase and the piggybank, two mundane symbols of everyday life, both ancient and contemporary, full of vicissitudes and wavering circumstances, compel us to explore where ordinariness lives and breathes, and for the right and wrong reasons in JaJaJaJaJaNeinNeinNeinNeinNein. Jan Kiefer (*1979 in Trier, Germany, lives and works in Basel, Switzerland). Since completing his master’s degree at the Academy of Art and Design in Basel in 2012, Kiefer has exhibited widely, in Switzerland and internationally, including at Kunstverein SALTS, Basel (CH), Union Pacific, London (UK), Kunsthalle Basel (CH), Kunsthaus Baselland (CH), Kunstverein Wiesen (DE), Kunsthalle Athena (GR), Gagosian Gallery (GR). In 2016 he received the Swiss Art Award.